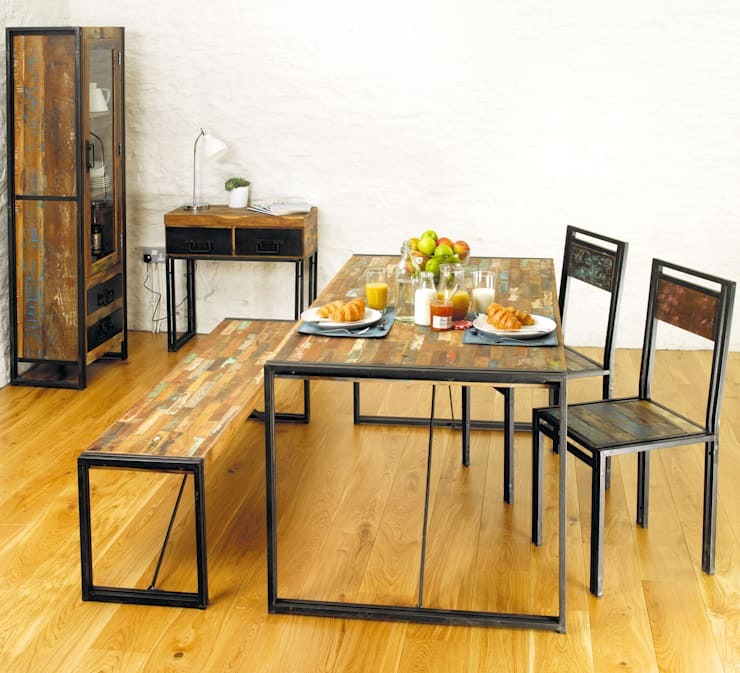 Reminiscent of the scruffy timber park benches you used as a child, these days bench style seating is a trendy and attention-grabbing addition to any chic and fashionable dining space. Forget the shabby recreational estate pine eyesores that were gnarled by years of mistreatment and wayward youths scrawling names into the table tops - these days bench-style dining sets are making a comeback. Whether you like the banquette style of a built in diner-style bench, or a freestanding option, there are plenty of styles to suit any home. 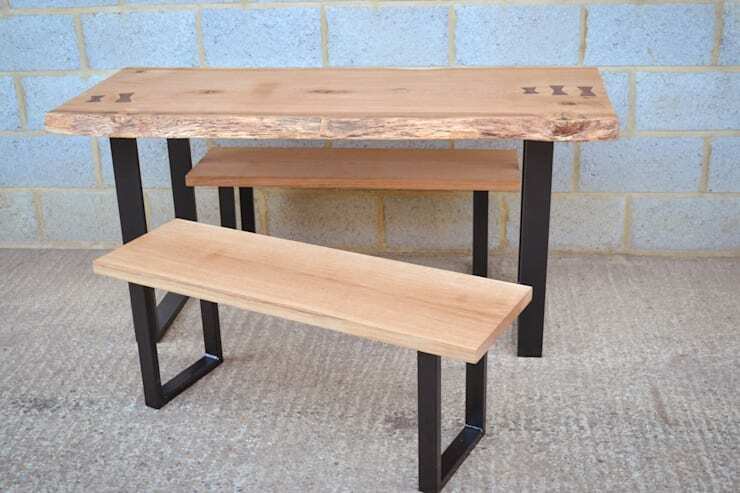 Today we are looking at rustic influenced bench dining. If you are low on space, or simply want to make a statement, this could be a perfect option for your domestic space. Browse the following exciting examples below, and consider a new and exciting way to dine in your dwelling. This gorgeous setting from Jude Burrows Interior Design infuses a sense of modernity whilst incorporating an element of traditionalism and style. Perfectly balanced between the crisp white colour scheme of the walls and the dark stained timber of the dining setting, this room oozes chic sophistication. Partly built into the alcove in the wall, this space maximises the architectural elements of the room to infuse a sense of cohesion and resoluteness. 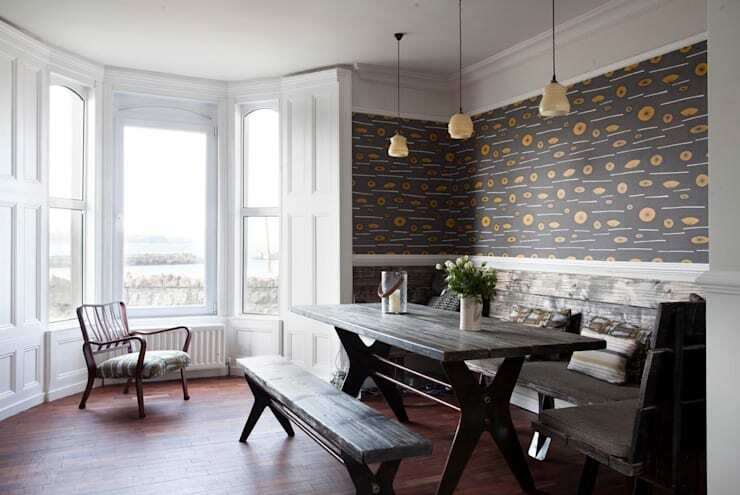 Think patterned wallpaper, industrial style bench table and matching seating with traditional yet stylish accessories and light fittings. This brilliant little dining set is perfect for a compact studio apartment, or indeed a larger home. It naturally evokes a sense of ease and adaptability. The light timber top is carved from one single piece of timber whiles the dark black metal legs coordinate and contrast wonderfully. This is a standout dining space, sure to exude a sense of style and design nous within your domestic dining space. The epitome of rustic home décor, this wonderful space blends a sense of industrial character with British tradition and liveability. The AGA cooker ensures the space feels warm and homely, whilst the added friendliness of the timber bench seating evokes usability and openness. To emulate this in your own home, think exposed brick walls, plentiful use of timber, and industrial elements such as metallic light fittings and iron table legs. 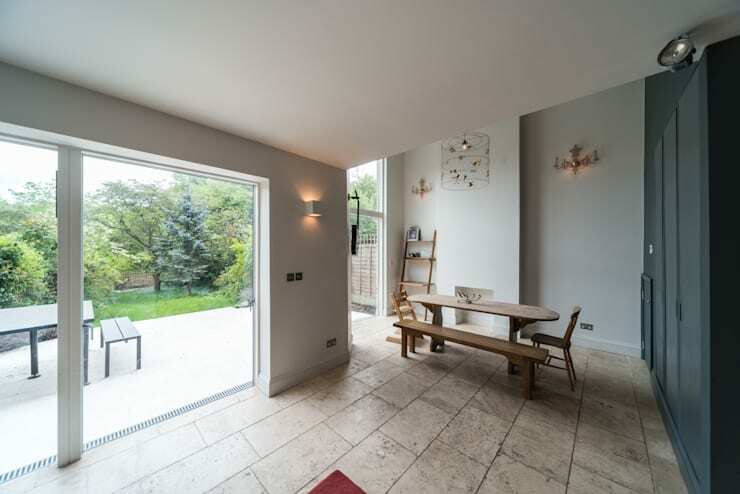 In this wonderful rear extension we see the fabulous use of two different sets of bench style dining. Outdoors the entertaining area is equipped with a large table, perfect for hosting get-togethers and parties. Indoors the dining setting is a comfortable timber collection of seats and surfaces, which work wonderfully to bring warmth into the space and contrast the large and cold stone tiles. Industrial design at its finest, this delightful rustic setting evokes a sense of contemporary style with hints of traditionalism and heritage. The iron legs of the table and chairs exude crispness, whilst the different hued timber brings interest into the design and creates a space that is effortlessly stylish. Reminiscent of something you may have eaten on in an American diner, this booth style seating takes dining to the next level of practicality and comfort. 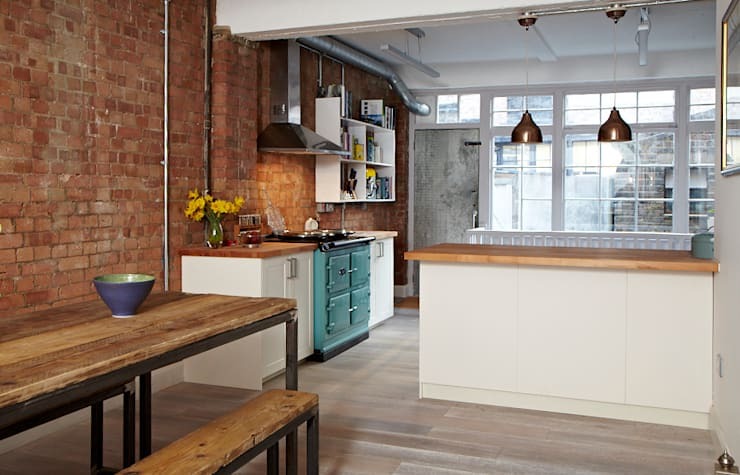 The bench seating against the wall is a wonderful way to maximise space and ensure the area is used to its fullest. In addition to this, the individual seating is a brilliant way to add interest and break up the monotony of bench seats or all chairs. 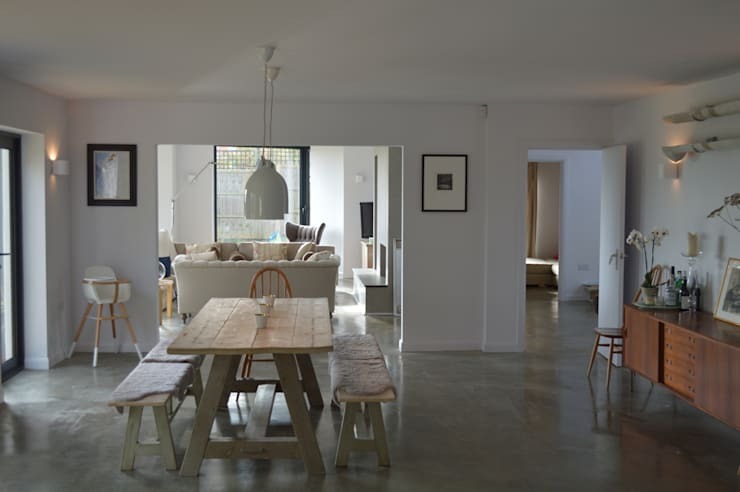 The combination of the two different types of seating adds a sense of style and modernity to the space, whist retaining its rustic liveability. Now we see a beautiful example of rustic bench seating in an archetypal British style. This table is gorgeous; the timber is uneven, light in hue, and matched with sage green legs. Furthermore the bench seating is a miniaturised version of the table and replete with comfortable coverings to ensure maximum cordiality and luxury.